Geek + runway = a hilarious runaway hit! This bestselling UK debut is full of humor and high-fashion hijinks—and now it’s coming to America. Harriet Manners is tired of being labeled a geek. So when she’s discovered by a modeling agent, she seizes the chance to reinvent herself. There’s only one problem: Harriet is the definition of awkward. Does she have what it takes to transform from geek to chic? 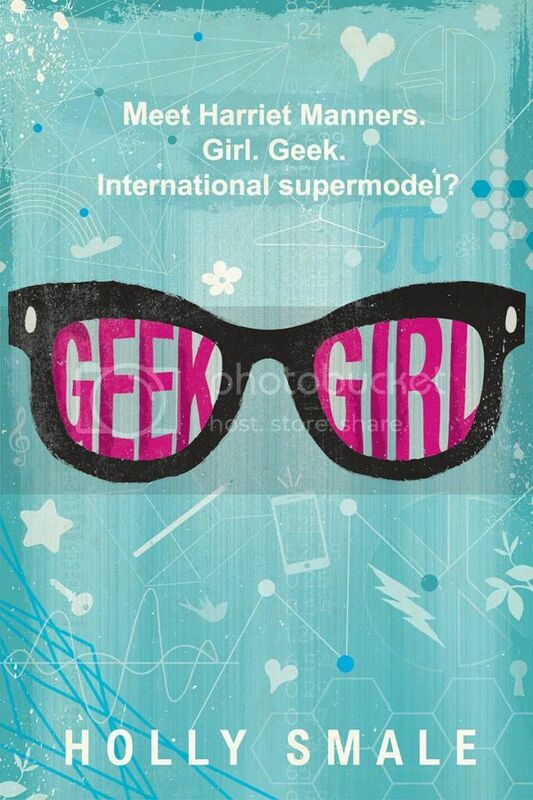 Geek Girl may be a new release in the US, but it’s a much loved series in the United Kingdom, and having read the first book, I now know why the series is so popular! This book was hilarious and super fun read! Harriet Manners is the definition of the word Geek. She has very few friends, is bullied by the most popular girl in school, and she has her very own stalker, who is also geek. When Harriet is offered the opportunity to become a model, of course she jumps at the chance to reinvent herself. But will changing everything about herself really make her life better?? Despite being a geek, Harriet has a pretty interesting life. I found most of her story to be pretty relatable, and I imagine most people have dealt with the issues that she had in one way or another. While she didn’t have such a great school life, she had a good support system at home. Her dad and stepmom are a bit eccentric; but they prove to be really great people as the story goes along. Her best friend, Nat, is also great, despite the few rough patches that they have throughout the story. Her whole life changes when she becomes a model, but I love that despite the changes, the old Harriet still shines through. It was interesting to watch her character grow throughout the story. The storyline for the book was fast paced, funny and refreshing. I read this during National Readathon Day, which is a four hour readathon, and I pretty much flew through the book during those four hours. I laughed and giggled as Harriet went on new adventures, I cringed as she had mishap after mishap, and even teared-up a time or two throughout the story. But I love how much this book made me laugh. I was rolling at certain parts. I’m really looking forward to reading more of the series to find out what’s going to happen with this story, and especially with the characters! Overall; if you want a quick, fun read that will make you laugh and laugh, you should definitely check out Geek Girl. After finishing the book, I can see why the series is so popular. I absolutely can’t wait to read the rest of the books in the series! Thanks for the review. I could use a good laugh right about now. Love the cover!! So retro but eye catching in its simplicity. Great review Christy :) I've been considering picking this one up, and I think your review just convinced me that I must! Your cover is much better than the one here, I must say! I haven't heard of this book, but it sounds great! I'll have to pick it up. Do you know when the rest of the books in the series are coming out? I love that this book will make me laugh! I could use that right now. I can't wait to read it. It sounds adorable and I had no idea it was a hit in the UK! Thanks for the great review! I can't wait to read this one myself! I have seen it around a lot in the UK and am looking forward to getting my hands on it. It sounds like a hilarious and light hearted book that still has a lot of meaning to it!